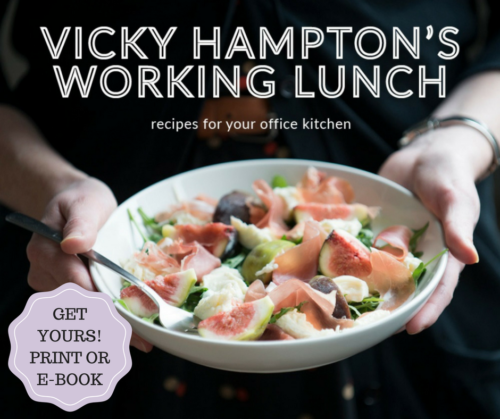 Working Lunch: Recipes for Your Office Kitchen – the Cookbook Relaunch! As the summer holidays come to an end, it’s time for many people – myself included – to get back to work. 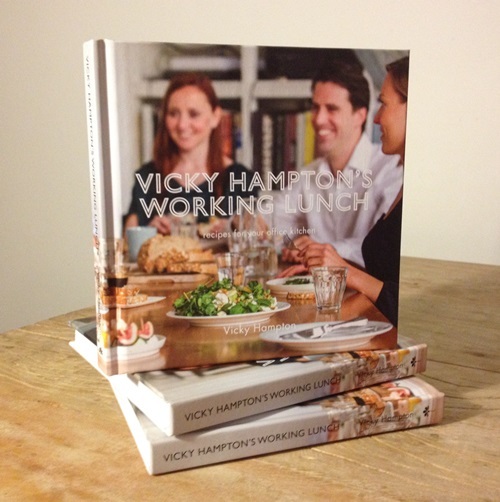 And in my case, that means one very important and very special thing: the launch of my e-cookbook, and the relaunch of my lunch cookbook, Vicky Hampton’s Working Lunch. Suitable for anyone interested in making a tasty, quick and healthy lunch either in the office or at home, the book covers 50 simple lunch recipes from vibrant salads to hearty couscous dishes to pimped-up sandwiches. You can buy it in printed, hard-cover format for just €14.99 (excluding postage) or as an e-book for €4.99. It all started around 2008, when I was working in an office just off the Leidseplein in the centre of Amsterdam, and found the local sandwich shops devoid of lunch inspiration. A couple of years later, I moved to a bigger office with its own canteen – there, the food got even worse. So I took matters into my own hands and started to bring food from the supermarket into work with me, whip out a chopping board and a knife from my desk drawer, and turn it into something eminently more delicious. Pretty soon, my colleagues got jealous and began asking me to make their lunches too – or at least to give them my lunch recipes. That’s where the idea for Vicky Hampton’s Working Lunch was born. Fast forward a few years and I’d written my book, but I was still trying to figure out how to publish it. Kickstarter didn’t yet exist in the Netherlands, and self-publishing was barely even a thing. In 2012, I crowdfunded the book through a platform called TenPages that later went bankrupt. I then found a small Dutch publisher who officially published the book in 2013, leaving me with a tiny royalty percentage. The project was painful in many respects, but I learned a lot along the way – not least that self-publishing would’ve been a much, much better idea. With no one promoting it, the book was dead in the water. That is until spring 2017, when I discovered that my publisher was also closing down. I had the opportunity to get the rights to my book back, and to buy up the remaining copies. I jumped at the chance to finally take back control of my cookbook so that I could promote and sell it myself. And that’s why, on in September 2017, I’m proud to say that it’s finally time for the relaunch! The book includes five chapters covering different types of lunch recipes, plus a list of “kitchen kit” items that you can equip your office or home with – although the only real prerequisite is a chopping board and knife! Salads and dressings – 10 salads, from light and summery to hearty and filling, many of which are also suitable for vegetarians. Plus 5 dressings that will elevate any salad to greater heights. Bread – perfect for when you’re bored of the ubiquitous ham and cheese sandwich, this chapter is all about making the most of your daily bread, from work-week “pizza” to tasty toasties. Couscous and pulses – from hearty couscous salads to homemade hummus to spicy bean tortillas, this chapter fills you up with the good stuff. Soups and smoothies – as useful at breakfast time as it is at lunchtime, this chapter is all about getting the bang for your mini-hand-blender buck. Pimp my lunch – for the budding chefs out there who want to impress the boss, or just throw an after-work dinner at home. Look at a sample of the lunch recipes or buy now! If you’re still looking to be convinced, check out this sample PDF to get an idea of the lunch recipes. Ready to buy the cookbook? Visit the webshop here.